In the world of growing plants and vegetables it is very well known that hydroponic growing is an incredibly good way to grow leafy plants. Just like cannabis. There are 6 systems which implement the hydroponic growing technique, one of which is the deep water culture system. As you may notice from its name, deep water culture system relies on a large amount of water to host the nutrients needed for a plant to grow to its full size. Hydroponic systems rely solely on water, as there is no soil involved in the process of growing plants with these techniques. Just type your email in the box below, hit the magic button and I’ll send you a free eBook which explains everything you need to know about hydroponic growing, including detailed guides for all of the 6 growing methods lined out above. It may be more than obvious, but this hydroponic system is called “Deep Water” due to the fact that the roots of the plants are submerged in water, and it refers specifically to the type of hydroponics where plants grow with the roots stretching out into a tub of oxygenized water loaded with nutrients. Since the plants roots get everything they need without having to “search” for it like they would in soil, they usually have a much faster vegetative growth rate. This growth rate is easily noticeable, as you’ll see big roots and even bigger nugs after the flowering stage. Deep Water Culture is perhaps the best way for first time growers to get into the grow game. There are several variation to the deep water culture technique, but 2 of the most common ones are Recirculating Deep Water Culture and Bubbleponics (top feeding DWC), but we’ll get to that a bit later. As any other growing technique, deep water culture has its positive and negative sides, however the upsides are much greater than the problems you might run into. The main difference when growing with a hand-watered growing medium is that you need to pay attention to the reservoir. Deep water culture is an easy way of growing and new growers get fantastic results with this technique. The secret is in the simplicity of the technique due to the fact that water is a much better solvent than soil. Plants grow noticeably faster in DWC during the vegetative stage than they do in soil, and that’s a fact. Plants that grow in soil spread out a huge system of roots, which they use to search for nutrients from the soil in which they live. Plants grown in soil also need to find pockets of oxygen to prevent the plant from (not)having a lack of oxygen. Hydroponic growing methods usually allow the plants to spread the roots throughout the whole water tank, which means that nutrient and oxygen intakes are both at a much higher level than when growing in soil. This is why plants grown in hydroponic systems grow with such speed and momentum. The oxygen in the water gives the roots almost unlimited amounts of oxygen needed for the alarmingly fast growth. It also prevents the plant from getting “over watered”, even if the roots are living in a reservoir of water. The general opinion is that growing cannabis in deep water is a lot easier than growing it in soil. The main reason behind that is that this system is easy to make, easy to maintain, and since almost everything is automated it does not require a lot of your time or dedication. Cannabis grown in a hydroponic setup will also always grow faster, which you can also see from the chart below. As I’ve mentioned previously, deep water culture works on a few simple principles that have been known to humanity for a few decades, if not longer. Since the main factors for a sped up growth are large amounts of nutrients and oxygen, that is exactly what DWC gives to the plants. The roots can’t get enough of oxygen, and increasing the oxygen available to the plants increases their uptake of nutrients which are dissolved in the water, which of course means more growth. This is why, in soil systems, we introduce additives such as Perlite or Vermiculite to induce air pockets to the medium. Roots of the plant grow downwards into the bucket of nutrient solution, becoming permanently suspended in the water where the extra oxygen allows them to assimilate the nutrients. Similar to other growing techniques, deep water culture also has a few variations to the technique. These variations, according to some, give better results and a bit larger yields than the standard DWC system. Bubbleponics are also know as a top feeding deep water system. It’s basically a DWC with a water pump added in the mix. This water pump is placed inside the bucket, from which it send nutrient filled water to the net pots in which the plants are held in. This can prove to be a very tangible benefit in the beginning of the cannabis plant’s life. Seedlings sprout and grow leaves faster in the beginning due to the increased amounts of nutrients the roots will be receiving. Ultimately, the benefits will diminish after a few weeks and you can go back to the regular DWC system since the water pump will only increase your electricity bills if you keep it around for another few weeks. Recirculating DWC works a bit different, as it has a water pump in a separate central reservoir which feeds several buckets. This means that not every plant has its water, rather that the water which is feeding the plants is circulating from one bucket to another. Other than that, there are no other significant differences. Assembling a DWC system is relatively easy if you are good with your hands. Even if you are not particularly crafty, putting together a hydroponic system is no rocket science, and literally everyone can do it simply by following these tips. Here are a few things you will need for any hydroponic setup. If you don’t purchase a kit, you can also get them piece by piece. You can buy all these materials in a grow shop, in most general stores, hydroponic stores, gardening stores or even online. Another very important thing to have in mind is the use of correct nutrients, and especially the right amount. Be sure to regularly monitor the pH and concentration of your nutrient solution. You can check the pH value by using an EC meter, as mentioned before. Keep the pH value between 5.6 and 6.2 and carefully follow the feeding program. It is not good for the plants if the value goes above or under this level, as then the water will be too acidic or too alkaline. The 2 most commonly used nutrients in almost every hydroponic setup are Flora Trio and Cali Magic, both of which can be found on Amazon for about $30 and $15 US, respectively. As to the amounts of nutrients and the timing of nutrient usage, feel free to rely on the chart above for the absolute best results. To all honesty, there is no precision with these things. Some people use nutrients throughout the whole process, some increase the amounts largely during the flowering stage, and I’ve even heard of people not using store bought nutrients but rather experimenting with their own versions to some degree of success. The choice of which nutrient you will use is entirely on you, all I can say is from my personal experience and from what I’ve read on the internet that these 2 brands have proven to be very good, especially for cannabis beginners in general and first time hydroponic growers. This is that cheap, college dorm, plants in the closet, super low key op. This is that “mom don’t open the garage doors I think there is a skunk inside” grow guide. You know that one uncle in your family that nobody saw since college but everyone know’s he’s alive somewhere out there? This is the guide that will help you grow weed that gets people lost forever. For first time growers I strongly recommend you use clones and not seeds for best results. Alternatively, you can use Northern light automatic and White widow automatic seeds for up to 10 week harvest. These are well known and already proven strains which grow well in both soil and hydroponic systems so you can’t miss with them. Use some silicon (or other appropriate waterproof adhesive) to attach your net cup to the lid. I usually recommend first time growers to start with either one or two plants per bucket, and 3 is already a party. I understand that having a single plant per bucket can be demanding and tiring, but it really does give best results, especially if this is your first grow. You want everything to be perfect, right? Let’s get to the next phase. 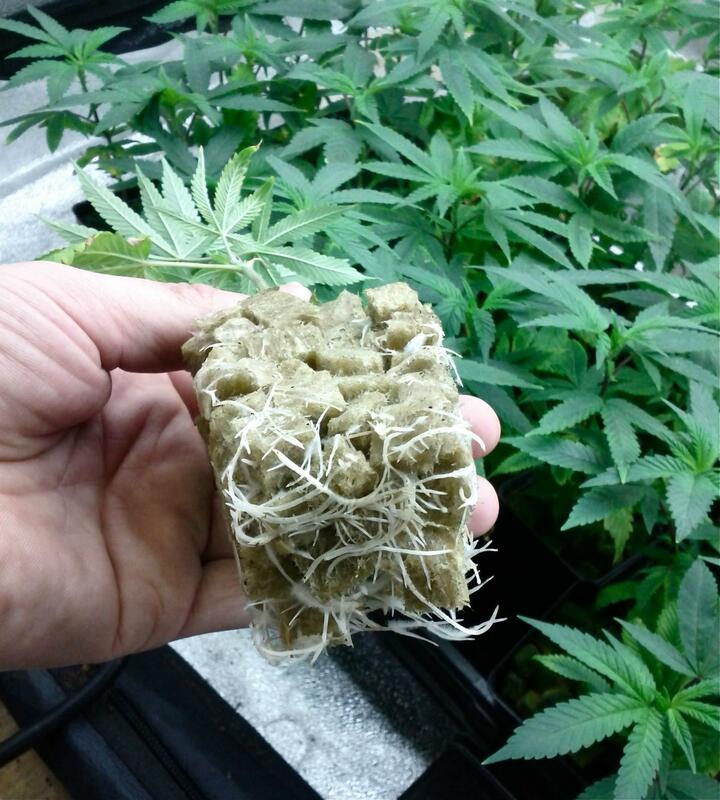 Once your plant has grown and you commence flowering, you can lower the level of the nutrient solution by a few inches so that most of the roots are submerged but the very top section is open to the air. Make sure you keep the water temperature at the room level. I have found that hydroponic plants tend to grow a little slower when their roots are cool, and grow fastest around 25°C as long as you’re using a supplement with beneficial organisms to kill root the root which may present itself at higher temperatures. No, this is not a reference to Rick and Morty episode in which giant heads attack the Earth and we finally find out that Ice T (the rapper, yes) is actually Water T, the element that was banished from its realm to protect our planet from alien invaders. Woah. No, this is a call for all of you readers that have previously grown cannabis in a DWC set up to share your experiences and results. I wanna see those huge nugs! I want that McNugget Sauce!